You work or attend school in the City of St. Louis. 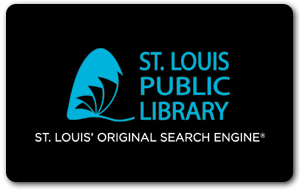 St. Louis Public Library requires identification that shows your name and current address to receive a library card or renew an existing card. Parents/Guardians of children under the age of 18 must present proof of guardianship when applying for their child's library card. Your library card is valid for one year. Fee-based cards are also available. Please call Customer Service at 314-539-0373 with questions concerning eligibility. If you live within the City of St. Louis, St. Louis County, or St. Charles County you can apply for an eCard that can be used for two years. With this eCard, you will be able to visit online databases, download ebooks, movies, television, magazines and music; and place holds on up to 3 titles. Visit any St. Louis Public Library location, with your current identification and you can pick up a permanent card with full borrowing privileges. Please note that available holds must be checked out within 7 days. For your protection, remember to report lost cards promptly to customerservice@slpl.org. St. Louis Public Library requires identification that shows your legal name and current address to receive a library card. Photo identification is required for the checkout of non-print items. If your identification does not show your current address, please present a piece of 1st class mail or e-bill dated with 30 days from the current date in addition to your identification. All adult cardholders have computer access. For questions concerning eligibility and borrowing privileges, please contact Customer Service at 314-539-0373 or customerservice@slpl.org. Other documentation may be accepted. Children under the age of 6 will be issued My 1st Library Card, which limits checkout to juvenile books only. Children over the age of 6 may be granted full or limited access to library collections and to internet use, depending on parent/guardian choice. Most of SLPL's personal library cards expire on the cardholder's birthday and must be renewed yearly. You will need to present identification that shows your name and current address. All fines or fees must be paid in full at the time of renewal. Library fines can be paid at all St. Louis Public Library locations or from your card account. When renewing a card for a child under the age of 18, the parent/ guardian listed on the child's library account must show current identification.